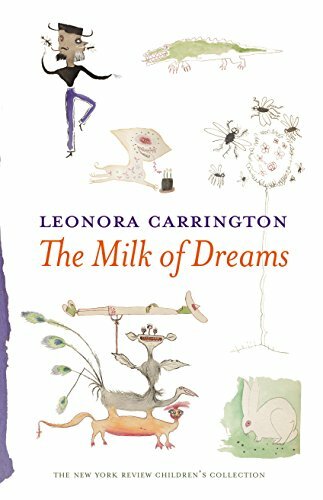 Absurd and atypical anecdotes pair up with bewildered drawings in Leonora Carrington’s The Milk of Dreams. A good choice for young readers looking for something different. Merge Shel Silverstein’s illustrated poems with the fantastical Roald Dahl, then blend in an era of surrealism tinted with a wildfire life story and there would form Carrington’s book. On the surface the pictures are mysterious, curious, alluring and completely original. They are sufficient in and of themselves to make the reader draw near. Once settled in, there will fountain over a trickle of thoughts the likes of which have never before been encountered. Unusual characters such as—the Child George, who eats walls and, consequently finds his head has turned into a house; Ophelia, who made a gelatin for a party only to find that a vulture had congealed in the middle of the dish; and the butcher Don Crecencio who makes roses out of goat’s meat—flitter through the story pages. The young readers will be heard saying “ewh . . . gross . . . disgusting . . . silly . . . weird,” among other typical kid-like exclamations. Also tucked neatly between the stories are little snippets of artwork assigned snappy titles. A pajama-sewing Señorita Gomez Castillo, a two faced Señor Mustache Mustache with his turkey, and a machine named Janzamajoria make cameo appearances. This book certainly is a one-of-a-kind find with a life and personality all its own. Adults, however, may wonder about what in the world this author was thinking, being that everything is so enmeshed in imagination. With this, a bit of biographical information goes miles in the way of explanation. Looking beyond the author blurb provided in the back pages of the book, it may be worthwhile to read the companion publication, Down Under, published in tandem with The Milk of Dreams. In it one might obtain an “aha moment” of understanding. A young Leonora Carrington (1917–2011) rebelled against, and fled from, the oppression of her aristocratic and wealthy British childhood only to end up a groupie/artist with the Surrealist movement in France and a mistress to Max Ernst (26 years her senior). She was with him when he was hauled away to a concentration camp as an “undesirable foreigner” and she suffered a mental breakdown. Confined to an insane asylum in Santander, Spain she suffered much cruelty but was rescued/released. Not pleased with her rescuer, she ran away to a Mexican consulate and escaped to Mexico where she eventually married, painted, wrote, raised a family. The quirky drawings from the walls of her home in Mexico were also kept in a little notebook, which she titled The Milk of Dreams. It is from that notebook that this children’s book emerged.